The COP21 Summit opened yesterday in Paris in a siege atmosphere due to the state of emergency decreed by the French government after the November 13 terror attacks in Paris. Thousands of army troops, police and paramilitary riot police roamed the streets, with many major roads closed off and control points set up in many places. Over 120,000 soldiers and policemen were deployed inside France, including 6,300 in Paris alone, after police used their emergency powers to brutally crush an anti-COP21 summit protest on Sunday. The final tally was 341 arrests and 317 people held overnight. Under these draconian conditions, the French government received the 195 delegations, including 145 heads of state arriving at Paris’ two main airports, Charles De Gaulle and Orly. Multiple highways serving those airports and large stretches of the Paris ring road were blocked to all traffic other than official vehicles bringing delegates to major Paris hotels. Initially, authorities announced that public transport in the Paris area would be free Sunday and Monday. Subsequently, however, the media and official sources warned that taking public transport would be dangerous and that workers should instead take a vacation day Monday. 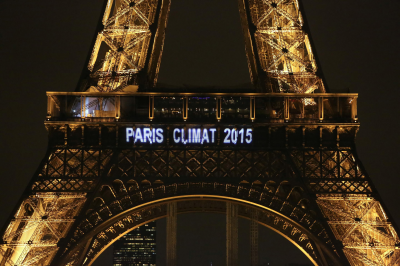 The few ecological proposals advanced at the COP21 summit were largely overshadowed by the security clampdown in Paris and the escalating risk of war between the major powers attending the conference. Under conditions where these powers are on the verge of outright military conflict in Syria and beyond, they are unsurprisingly proving incapable of coming together to address the complex ecological problems that the conference was supposed to address. In fact, no binding agreement on limiting global warming will emerge from the conference, and the main dynamic at the conference is the rising conflict between the member states. Even if the conference were to produce a concrete proposal, however, there will be no mechanism to ensure compliance by the major powers with the proposal. Last month, US Secretary of State John Kerry bluntly declared in an interview with the Financial Times that the Paris summit would not produce any enforceable agreement between the major powers. There is “definitively not going to be a treaty” coming out of the COP21 conference, Kerry said, adding that there was “not going to be legally binding [greenhouse gas] reduction targets like Kyoto,” referring to the 1997 Kyoto protocol. From the beginning, therefore, whatever ecological measures were formally agreed at the Paris conference would have little real significance. This first day of the summit was dominated not by the speeches on reducing pollution and climate change but by off-stage, private one-on-one discussions between the major powers trying to manage the enormous international tensions erupting over Syria. Turkey’s shooting down of the Russian bomber—a reckless move subsequently defended by Washington—has brought the danger of war between the imperialist-led NATO alliance and Russia to the breaking point. The Turkish Prime Minister, Ahmet Davutoglu, refused again on Monday to present Turkey’s excuses for the incident. Davutoglu also asked Russian President Vladimir Putin to reconsider the economic sanctions Moscow had just adopted against his country, saying “they run contrary to both our interests”. Putin has warned that the attack will have “serious consequences” for Russian-Turkish relations and has already expelled 37 Turkish businessmen from Russia. He described the attack as a “stab in Russia’s back” delivered by terrorists’ accomplices. He has shown satellite photos of fleets of trucks taking ISIS oil to Turkey to be sold on the international market. Putin signed a decree Monday evening taking effect immediately says that charter flights from Russia to Turkey are banned, that tour firms would be told not to sell any holidays there, that unspecified Turkish imports would be outlawed, and Turkish firms and nationals are to have their economic activities halted or curbed. “The circumstances are unprecedented. The gauntlet thrown down to Russia is unprecedented. So naturally the reaction is in line with this threat,” said Peskov, hours before the decree was published. Putin has suggested that US officials, to whom the Russians have been giving their flight data in order to avoid incidents during their missions, transmitted these details to Turkey as a NATO ally, allowing them to shoot down the Russian jet. “The American side, which leads the Coalition that Turkey is part of, knew where and when our warplanes operated [at the time of the incident]. And that’s exactly where the attack took place,” Putin emphasized. This is leading to a Russian escalation in the war in Syria. Moscow has announced plans for Russian SU-34 fighters to carry air-to-air missiles as well as bombs on their missions, and for the deployment of Russia’s most advanced S-400 air defense system in Syria. Plans for Russian oil and gas pipelines going through Turkey, with contracts worth billions of dollars, will likely be reassessed. At the same time, Russia has raised again the $3 billion in gas debts owed by the US-backed Ukrainian regime. In reality, according to Reuters, Obama told Putin again that Syrian President Bashar al-Assad must leave power as part of a political transition in Syria. The US position is opposed to that of the Russian government, which has insisted that the ousting of Assad cannot be a precondition for the beginning of negotiations to end the Syria war.